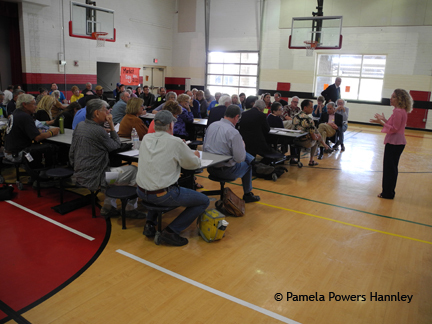 Sharon Thomas (right), outgoing co-chair of the Progressive Caucus, addresses approximately 80 progressives who attended the Arizona Democratic Party State Committee Meeting in Maricopa. 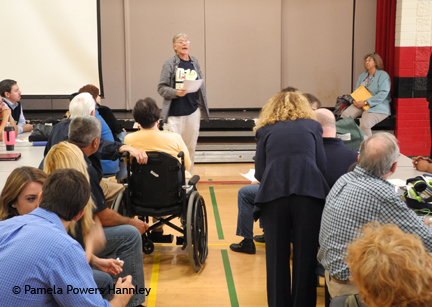 Unlike some past ADP meetings where progressives were ignored or where progressive resolutions were tabled and not heard by the full ADP membership, the Maricopa meeting was dominated by progressives. 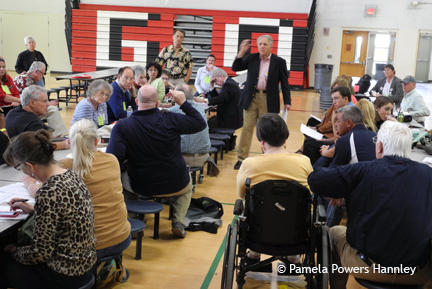 During the morning caucus meetings, approximately 80 members of the progressive caucus met in the booming high school cafeteria to hear about legalization of marijuana, the plight of Dreamers, and a host of progressive resolutions. In the progressive caucus, members unanimously endorsed resolutions: 1) in support of a Constitutional Amendment ending Citizens United and abolishing corporate personhood; 2) in support of passage of the Inclusive Prosperity Tax (AKA Robin Hood Tax); 3) against building the Keystone XL Pipeline; and 4) in support of allowing DREAMers to have Arizona drivers’ licenses and in-state college tuition. A resolution requiring clean elections candidates to give back extra funds passed, with some dissent. In addition, with only one dissenting vote, the Progressive Caucus voted to endorse Safer Arizona, the citizens’ initiative to legalize marijuana for personal use. Former state legislator and PDA Tucson Chair Phil Lopes explains the Robin Hood Tax to ADP Progressive Caucus members. In addition to the progressive votes, State Committee members enthusiastically applauded Progressive Democrats of America (PDA) activists Dan O’Neal and Barbara Njos, who were arrested in Maricopa County last week at a pro-DREAMer protest. PDA activist Dan O’Neal introduces a resolution to allow DREAMers to have Arizona drivers’ licenses and pay in-state college tuition. Congressional candidate Mikel Weisser introduced a Northern Arizona DREAMer who is petitioning Congressional Rep. Paul Gosar to back immigration reform. This entry was posted on November 18, 2013 by Pamela Powers Hannley in Arizona, Clean Elections, Democratic Party, environment, Immigration, Jan Brewer, Marijuana, Private Prisons, Progressive Democrats of America, Robin Hood Tax, Tom Horne, Tucson, War on Drugs and tagged criminalization of marijuana, DREAMers, Keystone XL Pipeline, marijuana, private prisons, Robin Hood Tax, Safer Arizona.